Temazepam is in a group of drugs called benzodiazepines (ben-zoe-dye-AZE-eh-peens). Temazepam affects chemicals in the brain that may become unbalanced and cause sleep problems (insomnia). 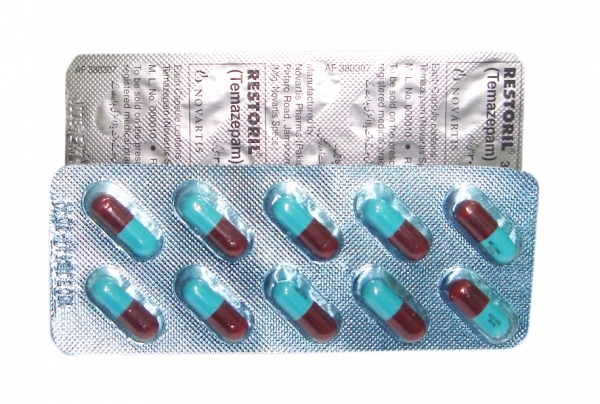 Temazepam is used to treat insomnia symptoms, such as trouble falling or staying asleep. Temazepam may also be used for other purposes not listed in this medication guide. What are the possible side effects of temazepam (Restoril)? Temazepam may cause a severe allergic reaction. Stop taking temazepam and get emergency medical help if you have any of these signs of an allergic reaction: hives; difficulty breathing; swelling of your face, lips, tongue, or throat. nausea, stomach pain, low fever, loss of appetite, dark urine, clay-colored stools, jaundice (yellowing of the skin or eyes). What is the most important information I should know about temazepam (Restoril)? Take temazepam only when you are getting ready for several hours of sleep. You may fall asleep very quickly after taking the medicine. Some people using this medicine have engaged in activity such as driving, eating, or making phone calls and later having no memory of the activity. If this happens to you, stop taking temazepam and talk with your doctor about another treatment for your sleep disorder. Do not use this medication if you are allergic to temazepam or to other benzodiazepines, such as alprazolam (Xanax), chlordiazepoxide (Librium), clorazepate (Tranxene), diazepam (Valium), lorazepam (Ativan), or triazolam (Halcion). This medication can cause birth defects in an unborn baby, or withdrawal symptoms in a newborn. Do not use temazepam if you are pregnant. Before taking temazepam, tell your doctor if you have any breathing problems, glaucoma, kidney or liver disease, myasthenia gravis, or a history of depression, suicidal thoughts, or addiction to drugs or alcohol. Do not drink alcohol while taking temazepam. It can increase some of the side effects, and could possibly cause a fatal overdose. Avoid using other medicines that make you sleepy. They can add to sleepiness caused by temazepam. Temazepam may be habit-forming and should be used only by the person it was prescribed for. Temazepam should never be shared with another person, especially someone who has a history of drug abuse or addiction. Keep the medication in a secure place where others cannot get to it. What should I discuss with my healthcare provider before taking temazepam (Restoril)? If you have any of these conditions, you may need a dose adjustment or special tests to safely take temazepam. Temazepam can cause birth defects in an unborn baby. It may also cause addiction or withdrawal symptoms in a newborn if the mother takes temazepam late in pregnancy. Do not use temazepam if you are pregnant. Tell your doctor right away if you become pregnant during treatment. Use an effective form of birth control while you are using this medication. Temazepam may pass into breast milk and could harm a nursing baby. Do not use this medication without telling your doctor if you are breast-feeding a baby. The sedative effects of temazepam may last longer in older adults. Accidental falls are common in elderly patients who take benzodiazepines. Use caution to avoid falling or accidental injury while you are taking temazepam. Do not give this medication to anyone under 18 years old. How should I take temazepam (Restoril)? Contact your doctor if this medicine seems to stop working as well in helping you fall asleep and stay asleep. Temazepam should be used for only a short time to treat insomnia. After 7 to 10 nights of use, talk with your doctor about whether or not you should keep taking temazepam. Your insomnia symptoms may return when you stop using temazepam after using it over a long period of time. You may need to use less and less before you stop the medication completely. Store temazepam at room temperature away from moisture and heat. Keep track of how many tablets have been used from each new bottle of this medicine. Benzodiazepines are drugs of abuse and you should be aware if any person in the household is using this medicine improperly or without a prescription. What happens if I miss a dose (Restoril)? Since temazepam is taken as needed, you are not likely to be on a dosing schedule. Take temazepam only when you have time for several hours of sleep. What happens if I overdose (Restoril)? Seek emergency medical attention if you think you have used too much of this medicine. An overdose of temazepam can be fatal, especially if taken with alcohol. Overdose symptoms may include extreme drowsiness, confusion, muscle weakness, slurred speech, tremors, a slow heartbeat, shallow breathing, feeling light-headed, fainting, seizure (black-out or convulsions), and coma. What should I avoid while taking temazepam (Restoril)? Do not drink alcohol while you are taking temazepam. It can increase some of the side effects, and could possibly cause a fatal overdose. Temazepam can cause side effects that may impair your thinking or reactions. Be careful if you drive or do anything that requires you to be awake and alert. What other drugs will affect temazepam (Restoril)? Before using temazepam, tell your doctor if you regularly use other medicines that make you sleepy (such as cold or allergy medicine, narcotic pain medicine, sleeping pills, muscle relaxers, and medicine for seizures, depression, or anxiety). They can add to sleepiness caused by temazepam. This list is not complete and there may be other drugs that can interact with temazepam. Tell your doctor about all the prescription and over-the-counter medications you use. This includes vitamins, minerals, herbal products, and drugs prescribed by other doctors. Do not start using a new medication without telling your doctor. Your pharmacist can provide more information about temazepam. I am afraid that these temazepam by Novartis Pakistan feel not like the advertised 30mg, but more like 15mg. Restoril 30mg made OUTSIDE Pakistan feel correct but sorry,mI tried these and required TWO caps in order to get the same effect as the Restoril which is made in the West. It may be the brand which outsells all other temazepam put together but the ones by Novartis PK are most definitely around half the strength on the box, and I intend to have them tested at the University since almost everyone I know who bought these says exactly the same. Can YOU afford to take TWO every time you require temazepam? At 39cents apiece I doubt it. Most people using these along with strong analgesics would be living on disability and would find it hard to afford their meds, so half strength simply is not good enough. And why are the other Restoril reviews talking about erectile dysfunction? ANXIETY!?!!?!?!?!!?!?!?!?!?!?!?! ?hi, i think i am suffering from delzraieation. i smoked alot high quality pot about 5 weeks ago from a aqua lung.. in the past before that. i smoked pot from time to time..while i was high, i had a major panic or anxiety attack. it Thought i was going to die, my heart was beating fast, i had major shortness of breath.. i was tripping out.. 7 weeks from my experience i have been feeling derelization symptoms. i know that i am real and all that, it's sort of like.. im not recognizing things, i know what things are..but i am not really recognizing them, i thought i was getting better but, it just hit me again now, and i think i am starting to get anxiety again..i am getting shortness or breath and some other symptoms. it is very hard to explain it's scary i am scared i might have gotten depersonalization disorder, is this anxiety? i know that my mom and sisters have had problems with anxiety. is this just temporary? i am going to tell my parents and go to a doctor if i dont feel better in 2 weeks. and when i do..i dont want to tell them about the weed i just wanna say that, i had a panic attack awhile ago and i havent felt the same since.. would that be alright, would i get the same diagnoses?all answers are greatly appreciatedp.s. i have not smoked pot since my experience, and dont telll me to go to a doctor or therapist..
Click the button below to add the Restoril (Temazepam) 30mg x 100 strip to your wish list.